Panorama of the Minarets at sunrise, near Mammoth Mountain. The Minarets are a series of seventeen jagged peaks in the Ritter Range, west of Mammoth Mountain in the Ansel Adams Wilderness. These basalt peaks were carved by glaciers on both sides of the range. The highest of the Minarets stands 12,281 feet above sea level. Basalt Photo. Devil's Postpile, a spectacular example of columnar basalt. Once molten and under great pressure underground, the lava that makes up Devil's Postpile cooled evenly and slowly, contracting and fracturing into polygonal-sided columns. The age of the formation is estimated between 100 and 700 thousand years old. Sometime after the basalt columns formed, a glacier passed over the formation, cutting and polishing the tops of the columns. The columns have from three to seven sides, varying because of differences in how quickly portions of the lava cooled. Basalt Picture. 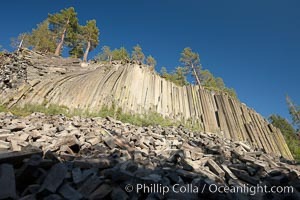 Devil's Postpile, a spectacular example of columnar basalt. Once molten and under great pressure underground, the lava that makes up Devil's Postpile cooled evenly and slowly, contracting and fracturing into polygonal-sided columns. The age of the formation is estimated between 100 and 700 thousand years old. Sometime after the basalt columns formed, a glacier passed over the formation, cutting and polishing the tops of the columns. The columns have from three to seven sides, varying because of differences in how quickly portions of the lava cooled. Stock Photography of Basalt. 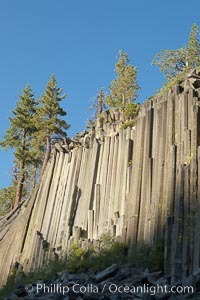 Devil's Postpile, a spectacular example of columnar basalt. 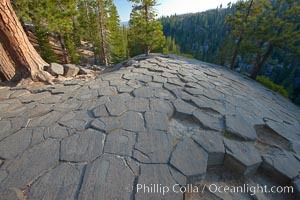 Once molten and under great pressure underground, the lava that makes up Devil's Postpile cooled evenly and slowly, contracting and fracturing into polygonal-sided columns. The age of the formation is estimated between 100 and 700 thousand years old. Sometime after the basalt columns formed, a glacier passed over the formation, cutting and polishing the tops of the columns. The columns have from three to seven sides, varying because of differences in how quickly portions of the lava cooled. Photograph of Basalt. 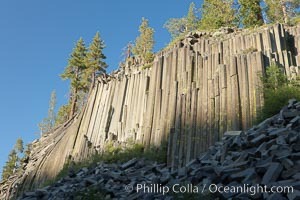 Devil's Postpile, a spectacular example of columnar basalt. 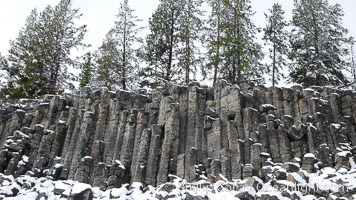 Once molten and under great pressure underground, the lava that makes up Devil's Postpile cooled evenly and slowly, contracting and fracturing into polygonal-sided columns. The age of the formation is estimated between 100 and 700 thousand years old. Sometime after the basalt columns formed, a glacier passed over the formation, cutting and polishing the tops of the columns. The columns have from three to seven sides, varying because of differences in how quickly portions of the lava cooled. Basalt Photos. Devil's Postpile, a spectacular example of columnar basalt. Once molten and under great pressure underground, the lava that makes up Devil's Postpile cooled evenly and slowly, contracting and fracturing into polygonal-sided columns. The age of the formation is estimated between 100 and 700 thousand years old. Sometime after the basalt columns formed, a glacier passed over the formation, cutting and polishing the tops of the columns. The columns have from three to seven sides, varying because of differences in how quickly portions of the lava cooled. Basalt Image. 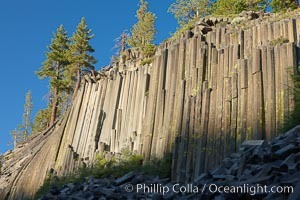 Devil's Postpile, a spectacular example of columnar basalt. Once molten and under great pressure underground, the lava that makes up Devil's Postpile cooled evenly and slowly, contracting and fracturing into polygonal-sided columns. The age of the formation is estimated between 100 and 700 thousand years old. Sometime after the basalt columns formed, a glacier passed over the formation, cutting and polishing the tops of the columns. The columns have from three to seven sides, varying because of differences in how quickly portions of the lava cooled. Professional stock photos of Basalt. 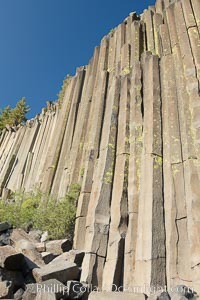 Devil's Postpile, a spectacular example of columnar basalt. 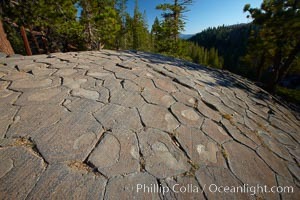 Once molten and under great pressure underground, the lava that makes up Devil's Postpile cooled evenly and slowly, contracting and fracturing into polygonal-sided columns. The age of the formation is estimated between 100 and 700 thousand years old. Sometime after the basalt columns formed, a glacier passed over the formation, cutting and polishing the tops of the columns. The columns have from three to seven sides, varying because of differences in how quickly portions of the lava cooled. Pictures of Basalt. 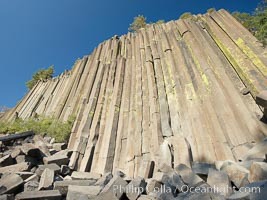 Devil's Postpile, a spectacular example of columnar basalt. Once molten and under great pressure underground, the lava that makes up Devil's Postpile cooled evenly and slowly, contracting and fracturing into polygonal-sided columns. 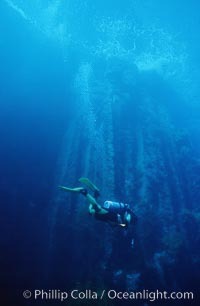 The age of the formation is estimated between 100 and 700 thousand years old. Sometime after the basalt columns formed, a glacier passed over the formation, cutting and polishing the tops of the columns. The columns have from three to seven sides, varying because of differences in how quickly portions of the lava cooled. Basalt Photo. Panorama of the Minarets at sunrise, near Mammoth Mountain. The Minarets are a series of seventeen jagged peaks in the Ritter Range, west of Mammoth Mountain in the Ansel Adams Wilderness. These basalt peaks were carved by glaciers on both sides of the range. The highest of the Minarets stands 12,281 feet above sea level. 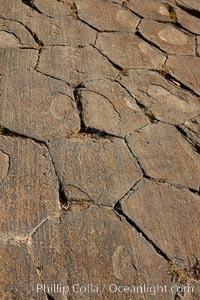 Stock Photography of Basalt. Sheepeater Cliffs, an example of columnar jointing in basalt due to shrinkage during cooling. Photograph of Basalt. 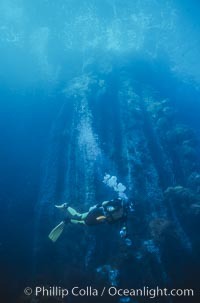 Basaltic columns, Los Arcos del Diablo. Basalt Photos. 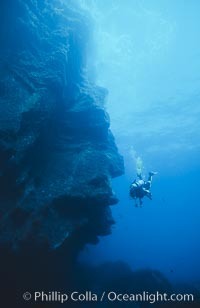 Basaltic columns, Los Arcos del Diablo. Basalt Image. Basaltic columns, Los Arcos del Diablo. Professional stock photos of Basalt.